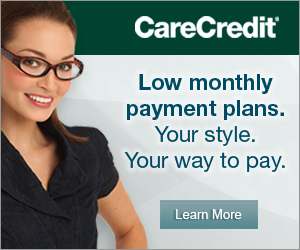 To better serve our patients, we have partnered with CareCredit™ in order to provide affordable payment options. This can apply to those who do not have health insurance or who are opting to receive elective procedures not covered by insurance. CareCredit™ offers a variety of payment options, and our payment counselors work with our patients to resolve which plan is best suited for their circumstances. You may also submit an application online or calculate your monthly payments by clicking the links below. If you require further discussion, you can apply in our office or by calling CareCredit™ at 866-834-3207. 0% INTEREST IF PAID IN FULL WITHIN THE PROMOTION PERIOD OF 12,18, OR 24 MONTHS. If the balance is not paid within the promotional period, interest will be charged to your account. Interest will also be charged if a payment is late or default in another way.